The extractor fitting is used to allow the removal of the foot valve easily from the top of the tank. 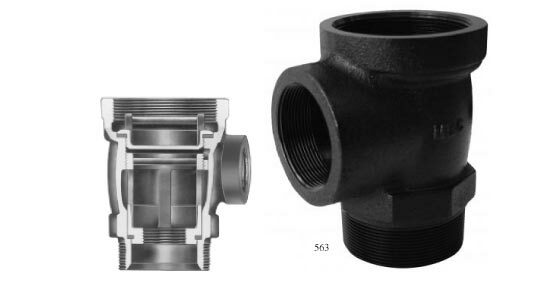 These fittings will allow single or double poppet foot valves up to 1.5″ in size to be used. The fitting will fit a 4″ NPT opening in the top of the tank with a 3″ line connection to the pump set. The top port is plugged with a 4″ plug when in normal use. The body is cast iron (epoxy painted) with a brass cage to hold the drop tube using a Buna-N O-ring.